Travel is discouraged this evening due to near blizzard-like conditions. 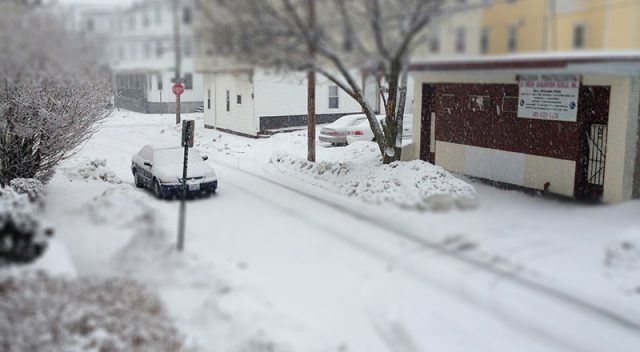 In preparation for a snowstorm that is forecast to intensify from 5PM – 11PM this evening with near blizzard-like conditions, the City of Providence has declared a citywide parking ban beginning at 6PM tonight, Saturday, February 15. The parking ban will remain in effect until further notice. Cars in violation of the citywide parking ban will be ticketed and towed to ensure that roadways can be plowed. Cars parked in school parking lots overnight will also be ticketed and towed. Snow is forecast to intensify dramatically during the evening hours, with possible rates of 1-3 inches per hour. Whiteout conditions are expected with an increasing northeasterly wind. Travel will be hazardous. Drivers and pedestrians are advised not to travel this evening given the rapidly deteriorating conditions. The Department of Public Works has prepared all equipment and personnel to respond to the storm. The City’s Emergency Operations Center will be partially activated with Providence Emergency Management staff. Residents can stay up to date on the latest storm developments from the City by using the filter #PVDsnow on Twitter and following the accounts of Mayor Taveras and PEMA. Residents will overnight parking permits and all residents are reminded that they are responsible for removing their cars from the street during the parking ban. Vehicles parked on the street in violation of the citywide parking ban will be ticketed and towed to ensure that roadways can be plowed. To prevent traffic congestion, motorists on the roads during the snowstorm are urged not to ‘block the box.’ Even if the light turns green, do not enter an intersection unless you are confident you will be able to travel through it before the light turns red again. Drivers are reminded to treat all obscure or non-functioning traffic lights as a four-way stop. The Providence Rink at the Bank of America City Center will close at 4PM today, Saturday, Feb. 15. Property owners are required to remove snow and ice from sidewalks, catch basins, fire hydrants and pedestrian ramps adjacent to their property within 8 hours after snow stops falling. Residents are advised to take care to shovel before temperatures drop below freezing tomorrow night, causing snow left on walkways to freeze. For more information about snow removal in Providence, visit ProvidenceRI.com/SnowReady.